Ever enjoyed a heaped forkful of classic German sauerkraut? What about a taste of the intensely bitter Indian mango pickle? Or perhaps you’re a fan of the funky, spicy bite of Korean kimchi? Whether you’ve tried these pickled foods or not, the point is that pickles play a major part in kitchens and dining rooms the world over—showing up in diverse forms made up of a nearly endless variety of vegetables, spices, and preparation techniques. We wanted to learn more about the ways our global neighbors use pickling, and of course the tasty outcomes, so that we might be able to implement a bit more pickling in our own kitchens. Humans have been harnessing the power of pickling for thousands of years—adding months to the otherwise short lifespan of perishable foods like meat and vegetables—making pickling one of the oldest techniques of food preservation there is. A fermented, pickled fish sauce known as liquamen or garum is one ancient example. Reigning in the times of ancient Greece, Rome, and Byzantium, it was made by simply packing whole small fish and fish intestines with layers of salt into special jugs—letting it ferment and soak in the sun. The salt would draw out the fishy liquids over a period of at least two days, or sometimes much longer. It's similar to the fish sauce we have today, popular in Southeast and East Asian cuisines, that is left to ferment for a matter of weeks, months, or years! In the 17th, 18th, and 19th centuries, salt pork was one of the most important examples of a pickled or cured food. Utilizing salt or salty brines and other spices to cure fatty cuts of pork, salt pork would be rationed out to passengers on long seaward journeys when fresh meat was scarce…or nonexistent. The differences here are subtle yet not so easy to define. Curing is defined as the preservation of meat, fish, tobacco, and even animal skins by various methods such as salting, drying, or smoking. Pickling is defined as the preservation of food or other perishable items in a vinegar, brine, or similar solution. Using these definitions, we can see the difference boils down to a dry or wet process. If it’s dry, meant to remove moisture in order to preserve, it’s probably cured. Corned beef is a great example to showcase just how closely the two methods are related, as it can be either cured with seasoned salt or pickled with a salty, seasoned brine. To get more scientific, just for a second, curing inhibits the growth of bacteria, allowing for only a small amount of fermentation to take place. It also helps to break down proteins, making meats more tender, or drawing out moisture to render meats a bit more dense and chewy. Pickling also breaks down proteins but does so by actually encouraging bacteria (all naturally occurring and harmless) which produce lactic acid and carbon dioxide that also help in the preservation of the food. Basically, if it’s a vegetable, most likely it’s been pickled, not cured, whereas meats can be both pickled and cured. But it’s the distinguishing acidic bite of pickled foods has become crucial in cuisines across the globe. How long to pickles last? Sealed correctly in a glass canning jar or unopened from the supermarket shelves, pickles can last for a long (seriously long) time. Although they may technically still be completely edible after 2 years, opening them before 2 years will generally result in the best quality taste and texture. After being opened, it’s safe to say that most pickles can be enjoyed for up to 1 year, if kept refrigerated at all times. 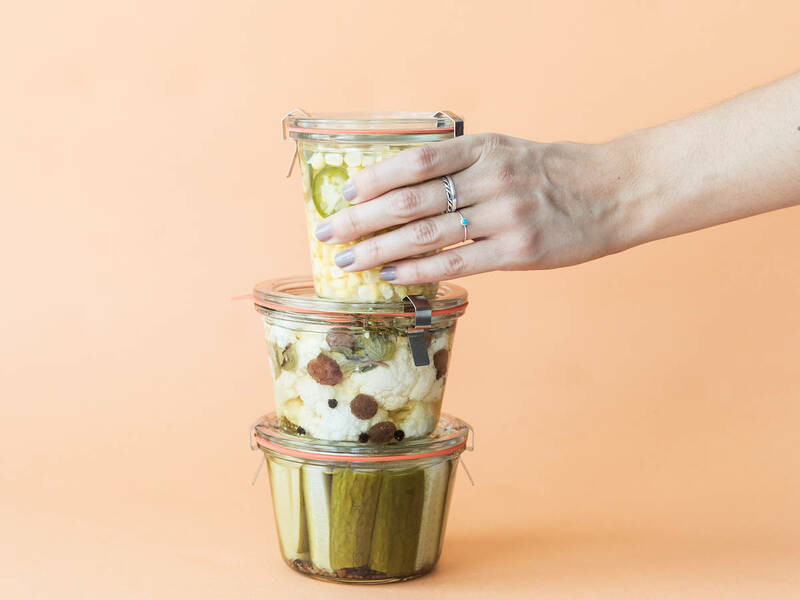 Of course, you should always be on the lookout for off odors or appearances, or mold—and throw away any pickles items that have these characteristics. From lacto-fermented pickles to refrigerator pickles, old-school canned pickles to quick fix pickled in a cinch, here are the three most common ways to make homemade pickles. It sounds more scientific than it is, so don’t let that scare you away. Basically, lacto-fermented pickles rely on the lactobacillus bacteria found naturally on the skins of vegetables. If you get your veg from a farmer’s market or organic market, the lactobacillus is most likely still present and your saltwater brine (no vinegar needed!) will become the perfect place for the bacteria to eat the natural sugars and produce lactic acid—making the pickles sour and helping to preserve them at the same time. After about 3 weeks, they are sour-ish and can be transferred to the refrigerator or left to ferment longer—at 6 weeks you’ll have some super sharp pickles. Vinegar brined pickles are probably the most common types of homemade pickles. You can make refrigerator pickles or canned pickles with a vinegar and salt brine. Which method you choose is entirely up to you and depends both how long you want them to last (canned pickles last longer) and how sour you want them to taste. Have you ever wondered what to do with the pickle juice left in your jars after the last pickle has disappeared? Whatever you do, don’t throw it away. Once a jar has been emptied, you use the brine again to make fresh, new pickles. Slice some cucumbers, chili peppers, blanched green beans, or carrots and place them into your jar with the leftover brine. Transfer them directly to the fridge. Depending on the flavor you’re looking for, they could be ready to eat in as little as an hour. Once your pickle brine has been used twice, use it as a brine for your next fried chicken. The base of nearly all pickle recipes is simple: salt. It’s the key ingredient that both seasons and preserves, and can be added to foods alone—drawing liquids out and packing flavor in (also called curing), or mixed with vinegar to brine foods into pickle-y submission. The more salt you use, the more sour the pickle you’ll get. Many recipes call for pickling salt, but you can also use kosher salt, canning salt, or sea salt. The brining method is the easiest, and more importantly, the quickest, way to perfect pickles. A brine is made up of a ratio of vinegar, water, salt and sugar and with additions of things like mustard seeds or onion, fennel fronds, or jalapeño, the flavor can be tweaked to nearly endless varieties. Here we have some basic ratios and ways to spice things up a bit to create 3 easy pickles at home. Keep this in your back pocket (maybe not literally) and experiment with flavor combinations and vegetables. From beets to eggs, cucumbers to cauliflower, the world of pickles is now your oyster. Oh, and lest I forget, to make sweet and sour pickles, just add sugar! To make a simple brine for any homemade pickle, from classic cumber pickles to fancy cauliflower pickles, bring 1 cup of distilled white vinegar, 2 tablespoons of kosher salt, and 2 teaspoons of sugar to a boil until the salt and sugar are completely dissolved. Pour the brine over your chosen vegetables, packed neatly into glass jars. Let cool for at least 24 hours at room temperature, transfer to the fridge, and enjoy for up to two months! To make different flavored pickles, add spices like black peppercorns, caraway seeds, bay leaves, cumin seeds, or star anise to the brine while it’s boiling, or tuck sprigs of fresh dill, slices of onion, peels from oranges or lemons, and crushed garlic cloves to the jar with the vegetables. In addition to cucumber pickles, try making pickled green beans, pickled cauliflower, pickled beets, or even pickled cherries or strawberries! What are your favorite kinds of pickles? Share with us and the community below!